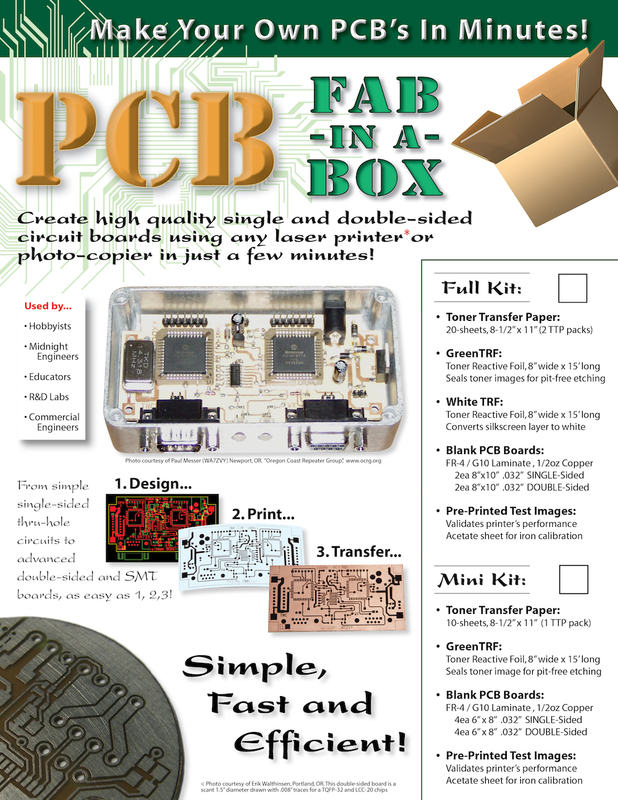 The "Starter kit" contains everything you need to start making single and double-sided PCBs in just a few minutes. 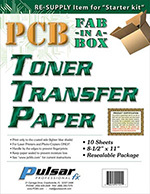 Contains: Toner Transfer Paper, Copper Laminate Board and TRF Sealing Foils. With either Starter kit and the recommended Tamerica "SM-330" laminator or a household iron (that has been calibrated. 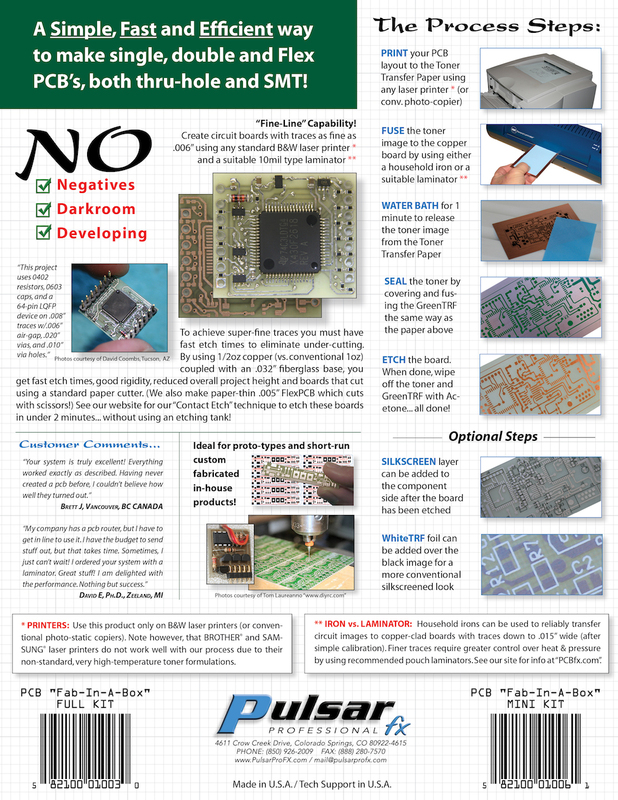 See TECH SUPPORT > Instructions > Using An Iron), you will have the ability to make high density, high quality single and double-sided PCBs, first time - every time, in about 8 minutes. Plus you can even do it WITHOUT using an etching tank! (We developed this unique technique a few years back that you've got to try to believe! See the MENU item: TECH SUPPORT > No Etching Tank). The Mini-Kit has 1 package of Toner Transfer Paper, 2ea 4-Board Packs of 6"x8" boards w/scrubbing pad (S/S + D/S) and one GreenTRF pack. 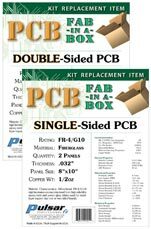 The "PCB Fab-In-A-Box" kit comprises 3 basic "components". All items are available separately so when a particular supply runs low, you can always reorder it separately. The first step in our process is to get your PCB design out of the printer via a special transfer medium coated with a special water-relase agent for perfect transfers when subjected to heat & pressure (from the laminator above). Our high-quality laminate boards are made in the USA (Conneticut, OH) by skilled lamination experts. They are custom made for us using 1/2oz copper foil on a built-up .032" thick fiberglass FR4/G-10 base. The GreenTRF foil is fused over the transferred circuit image on the board to seal the toner from "etch through". The WhiteTRF is optional for a parts insertion "silk-screen" layer. 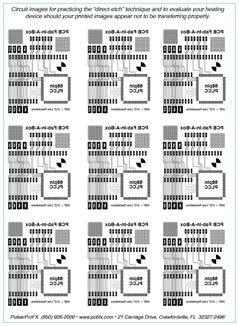 Also included in the "Starter Kit" is a special custom printed page of circuit test images on a sheet of Toner Transfer Paper used for trouble-shooting if your printed images aren't transferring properly. Used as a reference to compare the quality of your printouts. 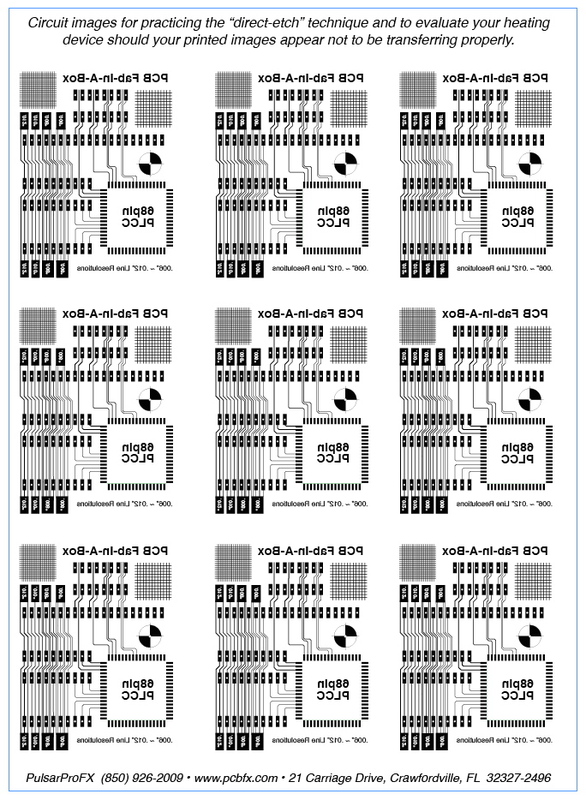 This page of test circuit images is printed using a new "branded" toner cartridge for guaranteed known density of toner to make perfect transfers. For optimum performance, you never want to use an "after-market" toner cartridge. They are just inferrior to "branded" cartridges. Having good toner density is most important for proper transfers to the copper's surface. If you find your are having transfer problems, that's when you'd use one of these images. It will immediately point to the source of the problem... either your laser printer is not putting out enough toner density or the TIA laminator is not working properly. <-Click the image here to see the incredible level of detail you will be able to achieve when using a laminator as the heat/pressure device. When using a household iron, you will be limited to about .015" trace widths. As with all of the products we produce, you have a full month to "kick the tires" after you recieve your system. If at any time you aren't absolutely in love with what our process can do for you, we'll buy it back at full price... even used, and no silly restocking fees, or discounting your refund. "If you don't love it, we want it back!" If you encounter any problems with any of our products, give us a call and let us trouble-shoot your situation. Tech Support from us is unending. Call us anytime! We're open 9am to 5pm MST.